Chipped beef is thinly sliced beef that has been pressed, salted, and dried. It can be used in numerous recipes from dips to casseroles. Here are some great recipes to try. 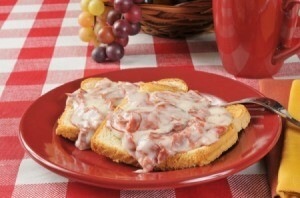 This page contains recipes using chipped beef. Chop chipped beef into small pieces. Chop olives in small pieces. Mix all ingredients together. Shape into a ball. Serve with your favorite crackers. This is an easy recipe and a family favorite. Mix ingredients together in the morning and refrigerate until evening. Cover and bake for 1 hour at 350 degrees F.
Combine all ingredients thoroughly and serve with your favorite chips.